The crinkle blade adds a new dimension to my potato case! This is an adaption of my ‘Burger in a potato crust’. This time it’s filled with sliced beetroot and parsnip, and I’ve used the crinkle blade on my mandolin to cut the potato slices, which has made it very pretty! You need 3 baking potatoes, 1 small parsnip, 1 small beetroot, plenty of salt and pepper and lots of melted butter (no fat will be coming from the meat filling this time). Please pop back to the ‘Burger in a potato crust’ page for the method. 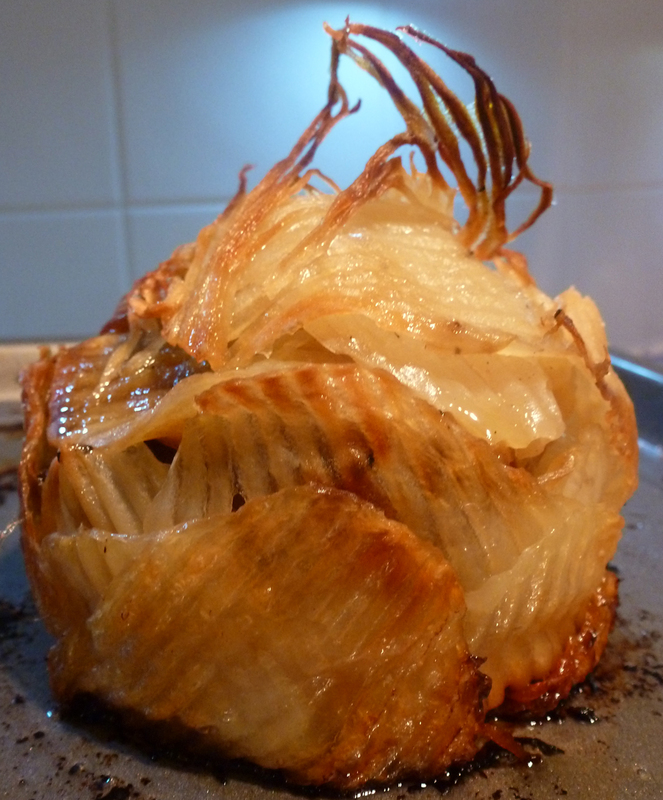 The sweet, rooty vegeatbles, cooked long and slow in the potato case made this the perfect accompaniment to pork. I like all of the ingredients from this dish, but have never eaten them together. I hope you don’t mind that it inspired a desire for a theme dinner party for friends. The thing is . . . it looks like one of those fish scientists find swimming about in the darkest depths of the ocean. At the left there is what appears to be a tooth-lined mouth. The decoration near the top could be tentacles or a fin. Those fish have no use for eyes so I don’t think I would add them. I think the mandolin gave the dish a jaunty appearance. I think it resembles the deep sea anglerfish. When I make it, I think I will serve for dessert a custard or pudding with tiny bits of graham cracker poking out of it like little shark fins. And we can watch Jaws after dinner. I know you said that it would go well with pork. What if I served it with wild salmon? An ocean fish might be more appropriate with my deep sea theme, but I’m open to other ideas. Sounds absolutely great! The themed dinner party is a great idea – we enjoyed many with our neighbours, including the Halloween one I wrote about on here. Hubby did a sea-inspired dinner. His starter was savoury jellies – little decorative bits of vegetable (carrot, beet, cucumber) embedded in a jelly made with gelatine and chicken stock. It looked like we’d got a little tower of sea on our plates! You could make the jellies extra fishy with slices of smoked salmon. I had a wonderful starter at a posh hotel that was a mix of smoked salmon, horseradish cream and apple sorbet. Smoked salmon/apple/horseradish seem a great combo of flavours.